Don't get distracted. The biggest weekend story was the other 2016 Trump Tower meeting. WASHINGTON — On Sunday, President Trump asked the Justice Department to investigate whether anyone infiltrated or surveilled his campaign — reacting to the reporting that an informant talked to two Trump officials (George Papadopoulos and Carter Page) after the FBI received evidence that the two men had suspicious links with Russia. “I hereby demand, and will do so officially tomorrow, that the Department of Justice look into whether or not the FBI/DOJ infiltrated or surveilled the Trump Campaign for Political Purposes - and if any such demands or requests were made by people within the Obama Administration!” Trump tweeted. And it appears the Trump Justice Department has obliged (although do note the careful wording here): “If anyone did infiltrate or surveil participants in a presidential campaign for inappropriate purposes, we need to know about it and take appropriate action,” said Deputy Attorney General Rod Rosenstein in a statement. But ask yourself the question: What will this past weekend be known for — Trump’s saber-rattling, or the reporting that the investigation into the 2016 Trump campaign is MUCH MORE COMPLEX than we originally knew and that those 2016 contacts could have formed the administration’s foreign policy? We’re putting our money on the latter development. 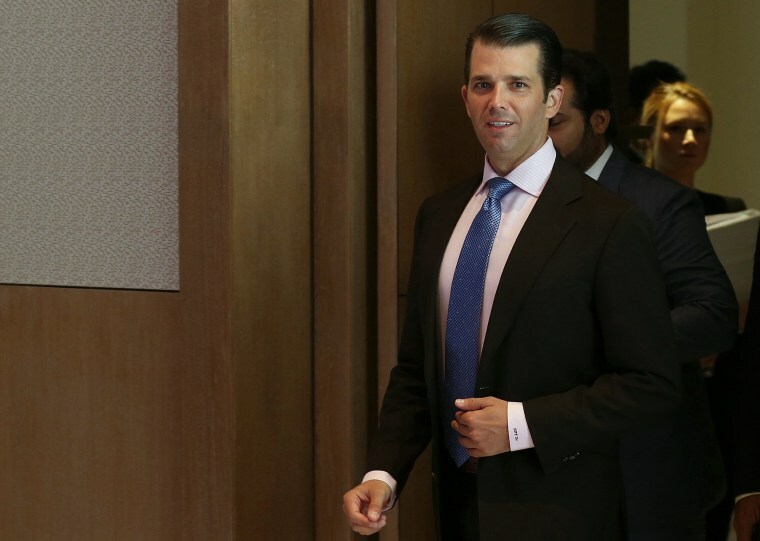 Don’t get distracted — that reporting of a second Trump Tower meeting in 2016 was the biggest news from the weekend. How can the president ask for an investigation into a matter where he can’t get his facts straight? Yet regarding that other story from the weekend, here’s a question to ask: How can a president ask for an investigation into a matter where he can’t get his facts straight? Or this other Trump tweet from Sunday: “The Failing and Crooked (but not as Crooked as Hillary Clinton) @nytimes has done a long & boring story indicating that the World’s most expensive Witch Hunt has found nothing on Russia & me so now they are looking at the rest of the World!” But the New York Times piece Trump was referring to NEVER said the probe had found “nothing” on Russia. Indeed, the Mueller probe has charged 19 individuals with crimes, five of whom have pleaded guilty. Or this tweet: “At what point does this soon to be $20,000,000 Witch Hunt, composed of 13 Angry and Heavily Conflicted Democrats and two people who have worked for Obama for 8 years, STOP! They have found no Collussion [sic] with Russia, No Obstruction, but they aren’t looking at the corruption.” The Russia probe is overseen by Republican Deputy Attorney General Rosenstein (appointed by President Trump), Republican Special Counsel Robert Mueller (who served as FBI director under George W. Bush from 2001-2008 and under Barack Obama from 2009-2013). The 2018 midterms are shaping up to be more than the Year of the Woman; they’re likely to be the Tsunami of the Woman. It’s Stacey (Abrams) vs. Stacey (Evans) in the Democratic gubernatorial primary — a contest that’s been divisive from the get-go. (Last summer, Evans was shouted down at the progressive Netroots Conference by Abrams backers.) The scarce polling so far has shown Abrams ahead, and she's been endorsed by national Democrats like Bernie Sanders and Kamala Harris, while Evans' supporters are from Georgia state politics. The Stacey-vs.-Stacey winner takes on the victor of a crowded GOP field including Lt. Gov. Casey Cagle and Secretary of State Brian Kemp. Another female-vs.-female contest is the runoff in Texas’ 7th congressional district, where Lizzie Fletcher (who’s backed by EMILY’s List and is the preferred choice among national Democrats) faces off against Laura Moser (who’s favored by progressive groups). This race attracted national headlines earlier this year when the DCCC released oppo on Moser. In another runoff in the Lone Star State – for the top of the Democratic ticket – female Lupe Valdez (the former sheriff of Dallas County) competes against businessman Andrew White (the son of the late Texas Gov. Mark White). In the runoff to determine the Democratic nominee in one of the nation’s most competitive districts – represented by vulnerable Rep. Will Hurd, R-Texas, it’s Gina Ortiz Jones vs. Rick Trevino. Ortiz Jones, who got 42 percent of the vote to Trevino’s 17 percent in March’s primary, is the favorite. But in this runoff to determine the nominee to face Rep. Pete Sessions, R-Texas, in November, male Colin Allred (who got 38 percent of the vote in March) is favored against female Lillian Salerno (who got 18 percent). And it’s yet another female vs. male race in this competitive district between retired Marine Lt. Col. Amy McGrath and Lexington Mayor Jim Gray. The winner takes on vulnerable Rep. Andy Barr, R-Kentucky. By the way, in the 10 states that have already held their primaries, half of the women who’ve run for Congress have won, according to a New York Times analysis. Expect that trend to continue tomorrow. 1. The House GOP’s failure to pass the farm bill: “[T]he conservative House Freedom Caucus withheld their votes for the farm bill, joining Democrats who opposed its cuts to food programs for the poor. The combination resulted in the bill’s failure and left Republican leaders scrambling to find a path forward on a bill that is one of their remaining legislative priorities for the year,” per NBC News. 2. Trump personally asked the U.S. postmaster general to raise rates on Amazon and other firms: “President Trump has personally pushed U.S. Postmaster General Megan Brennan to double the rate the Postal Service charges Amazon.com and other firms to ship packages, according to three people familiar with their conversations, a dramatic move that probably would cost these companies billions of dollars,” The Washington Post wrote.